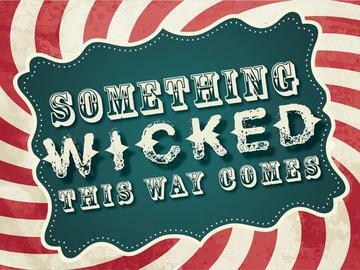 The season kicks off with a classic tale of good and evil, Ray Bradbury’s “Something Wicked This Way Comes”. Two boys become lured to a mysterious carnival that passes through their town. Soon they discover the diabolical truths behind the funhouse mirror maze and the eerie cast of characters. The boys fight to save their Town from this sinister carnival that threatens to destroy it. Produced by special arrangement with Dramatic Publishing. Auditioning mid-August. The second show of the season, “S#!tfaced Shakespeare”, combines the literary academics of Shakespeare with the maniacal tomfoolery of a totally smashed cast member! Audiences get to pick the play and which actor they would like to see stumble through Shakespeare, after imbibing a few shots of whiskey! There will be a special performance/party on New Year’s Eve. *For mature audiences due to adult language and situations. “I Am My Own Wife” closes out the season. This Pulitzer and Tony award-winning show, written by Doug Wright, is based on a true story about an East German transgender woman, Charlotte von Mahlsdorf. The play is a vivid portrait of a unique person whose ability to endure and survive the Nazi onslaught and the repressive East German regime, is a fascinating and stirring tale. Produced by special arrangement with Dramatists Play Service. Want to speak to our Box Office? Give us a call at 602.734.5734 Monday-Friday 12:00 - 5:00 p.m.